As of now we will be open tomorrow but check here, Facebook or your email for changes. Let our birthday staff help you plan your child's special day at fLipSpot. Our ALL INCLUSIVE Birthday Packages are listed below and are available on Saturdays and Sundays. Reservations require a $100.00 non-refundable deposit. To reserve your spot call 248-340-0910. 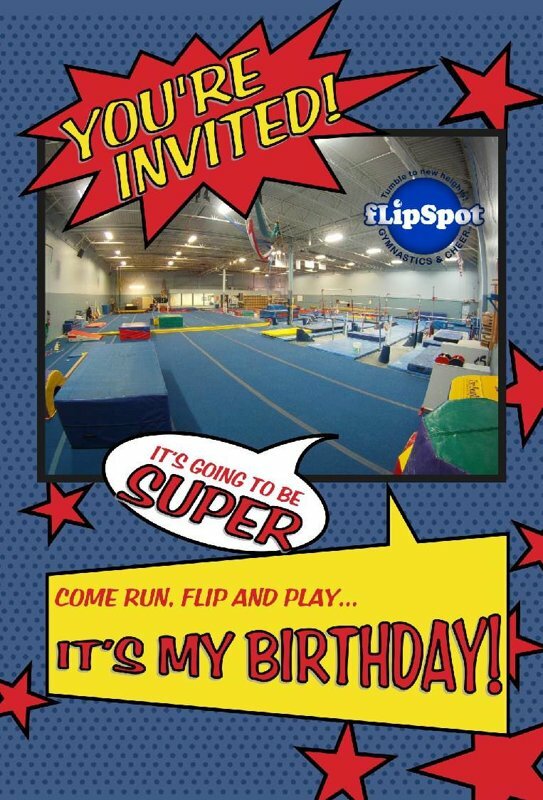 All children are required to have a parent/guardian signed Waiver to participate in the fLipSpot birthday activities. Final payment and waivers must be received the day of the party. Children 18 months to 3 years of age MUST be accompanied by a parent at ALL times in the gym and an adult waiver signed. Parents & guests may watch the spills & thrills from the observation room EXCEPT those parents with kids under the age of 4. The hosting parent/guardian is responsible for transportation of party attendees to and from fLipSpot Gymnastics & Cheer, LLC. The host may not leave the premises during the party until the last attendee has left the premises. Parents, with a signed waiver, of the celebrant can take photos and video in the gym while their child is celebrating their birthday. Family members and their guests of the birthday celebrant need to remain in the observation area at all times for safety reasons. Food can be added for additional cost. Plus a $25 flat rate fee for setup, clean up, tablecloth, plates, napkins, utensils, and waters.